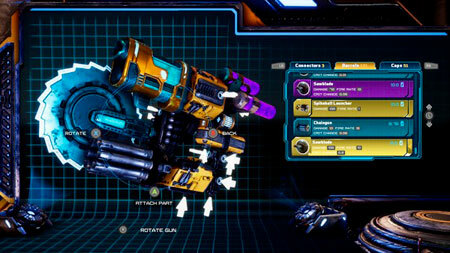 Mothergunship Gun Crafting Range is a unique gun customization FPS game developed by Grip Digital, Terrible Posture Games. Craft your own guns, play together with your friends, fight gigantic bosses and defeat a robotic alien armada that conquered Earth. Take the fight to the enemy, craft gun monstrosities that no reasonable person could ever lift, and experience randomized mayhem as you battle your way to the heart of the fleet. The game gives you a taste of the customization and modularity of the full gun crafting system, and provides a testing arena and small story to experience. Collect parts from taking down enemies to continue the building process and create the most nonsensical monstrosity possible. If you get stuck in the game, check out the video walkthrough and gameplay for the game. This entry was posted in PC Games, Walkthrough and tagged Mothergunship Gun Crafting Range Cheats, Mothergunship Gun Crafting Range Game, Mothergunship Gun Crafting Range Gameplay, Mothergunship Gun Crafting Range Guide, Mothergunship Gun Crafting Range Hints, Mothergunship Gun Crafting Range Review, Mothergunship Gun Crafting Range Solutions, Mothergunship Gun Crafting Range Strategy, Mothergunship Gun Crafting Range Tips, Mothergunship Gun Crafting Range Walkthrough by Marvin. Bookmark the permalink.